US, 1936, 141 minutes, Black and white. Frederic March, Olivia de Havilland, Donald Woods, Edmund Gwenn, Gale Sondergaard, Anita Louise, Claude Rains, Louis Hayward. 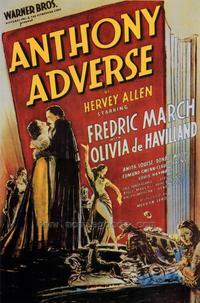 Anthony Adverse was one of the big Warner Bros blockbusters of the mid-30s. It was nominated for an Oscar for best film and for art direction. It actually won several Oscars: Gale Sondergaard as best actress in a supporting role, the Oscars for best cinematography, musical score and best film editing. The film was based on a popular novel of the period. It begins in Italy with a very melodramatic plot, a young woman married to a cruel older husband is in love with a younger man who is killed by the husband. The mother gives birth and the baby is given to an orphanage where he is called Anthony Adverse because of his difficult life. When he grows up, the story becomes something of a swashbuckling adventure as Anthony Adverse travels the world. His journeys take him to Cuba and to Africa and finally to Paris. The film has a particularly strong cast although there was criticism of Fredric March in the title role because he seemed somewhat old and serious for the role. The leading lady is Olivia de Havilland at the beginning of her career, in her very early twenties. (She had already appeared with Errol Flynn in Captain Blood and was to continue at Warner Bros for a long period.) Olivia de Havilland won two Oscars as best actress: in 1946 for To Each His Own, in 1949 for The Heiress. The usual character actors from Warner Bros appear in supporting roles including Anita Louise, Edmund Gwenn who had just come from England, Claude Rains who was to begin a career in Hollywood after an English career performing as dastardly villains in so many films. Louis Hayward was also at the beginning of his career as a rather more dashing hero. Gale Sondergaard is particularly striking – she was to have a strong career as enigmatic and sinister women until she was blacklisted during the McCarthy? era. The film was directed by Mervyn LeRoy? who worked at Warner Bros and made a range of films including Little Caesar and I Am a Fugitive from a Chain Gang. 1. How enjoyable was this film: the history, spectacle, colourful historical entertainment? its most enjoyable features? 2. How does this 1930's film compare with similar types of film now? The quality of the black and white photography, musical score, use of sets and studios, its historical scope, the number of characters, their exploration? the focus? 3. The scope of the film? The emphases on the spectacle, theme, characterisation? How were each limited by the scope of the film? 4. The importance of the war settings and the effect of war on the characters’ lives? 5. War and the meaning of wars? Napoleon and the Napoleonic war perspective? How interesting was the historical setting? how well recreated? Not only the war atmosphere, the impact of the human element? The meaning of the events? 6. How successfully did the film depict Anthony Adverse? Background of his birth and childhood? treatment by his father? A victim of society, a victim of individuals and their impact on him? an orphan, the upbringing in the convent, the influence of the nuns and Father Xavier, the influence of religion and its principles? 7. The irony of his going to Mr Bonnyfeather? The relationship? The irony of their meeting and not meeting? The significance of his name and this being pointed out? What was he being prepares for in his life? How strong was audience expectation for him? How interesting a hero? 8. The presentation of Maria’s love and forced marriage? the temptation of real love? the effect of Don Luis on her? The attractiveness of Don Luis, the nature of the love, the death of Don Luis? the vindictiveness of Don Luis and the duel? the attitude towards the boy Martin? How effective a villain for the film was Don Luis? His taking the cure, disillusioned with Maria’s behaviour? Bitterness at the birth and her death? Giving up the child? the influence continuing in Anthony's life, his blame with faith, retribution coming on, faithless blackmail? Don Luis' decline in his later years, his bitterness at the end in trying to destroy Anthony? The coach on the cliff, his not succeeding? 9. What impression did Anthony make as a grown man? The influence of Bonnyfeather on him as a person, his trade, his capacity for work, his aim and the irony of his not getting it? How strong the portrait of Angela? A suitable heroine for the film? The accidents of their not meeting? The marriage and the child? The discovery of her liaison with Napoleon? Her sincerity in the situation? Her role as Madame George? Was It right that she should leave Anthony? just a noble gesture or the best that she could do? 10. The importance of Anthony’s friend and its consequences in Paris and his escape from imprisonment? 11. How successful a villainess was Faith? Her sinister presence in the Bonnyfeather home? Her wanting the money? Her betrayal of Anthony in not saving him? 12. Anthony in the Carribean, atmosphere for the f ilm and the effect on him? Anthony's reaction to the slaves, the repercussions for him? 13. How important was the slave issue? Was it sympathetically portrayed? Anthony's response initially? The role of money and its hold? His own participation in the arms trade? Audience response to this and to the characters’ attitudes and behaviour? 14. How interesting were the African sequences? The dominance of money and power? The attraction of Neleta? Her desperate hold on him? The contrast of Brother? The irony of Anthony’s rescuing him, his need for rescuing Anthony? The impact of his death and the effect on Anthony? 15. The ironies of his struggles, the encounters faith and Don Luis? 16. Did the film successfully build up to the Paris climaxes? The portrayal of Napoleon? devices to send him on a mission? 17. Was the ending satisfactory bringing themes and issues to conclusion? 19. Even though this is a very old style film, how enjoyable is it today?